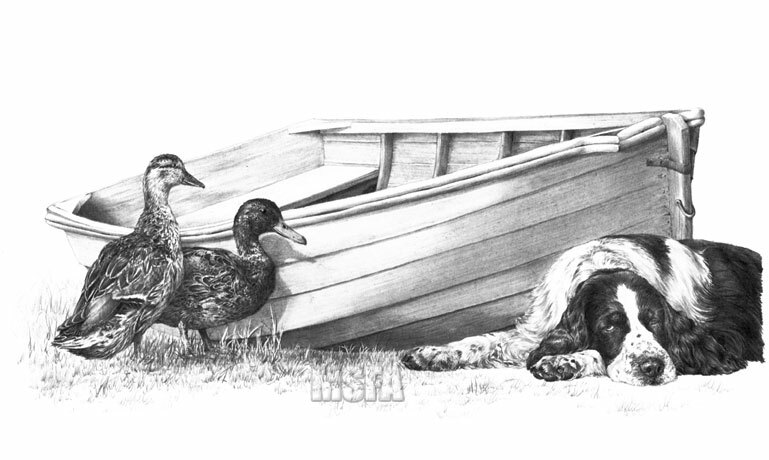 Take one photograph of an English Springer Spaniel in front of a fireplace, a photo of a boat (which I wanted to draw but it wasn't quite right for my Newfoundland study "The Turning Tide") and a couple of personal album photos of two of our ducks and you get... "Peekin' Duck". It's as simple as that - three elements that I wanted draw that slotted seamlessly together into one study. The original drawing took 16 hours and 6 minutes to complete and remains in my own collection. image : 10" × 8"